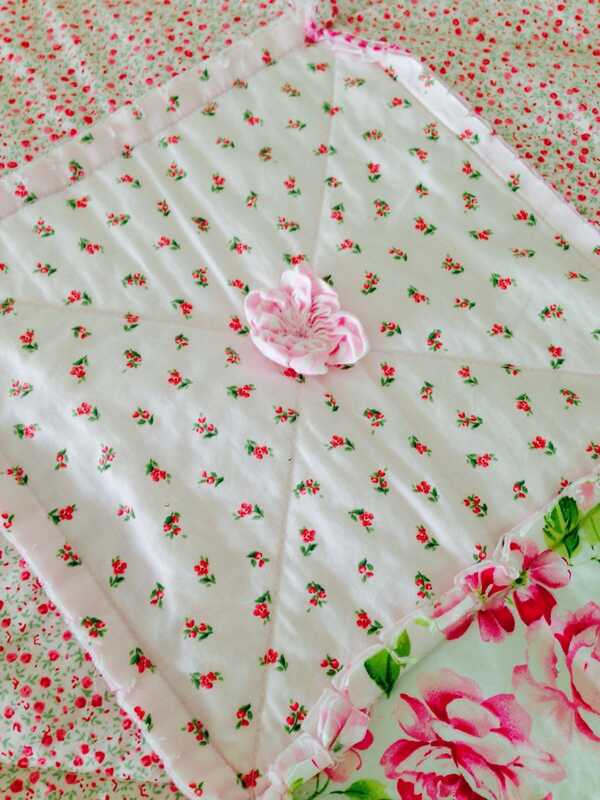 Rose Rag and Puff Throw Quilt. This is a fun project, for any skill level. I know we can make serious quilts, but sometimes a project like this is a good motivator. 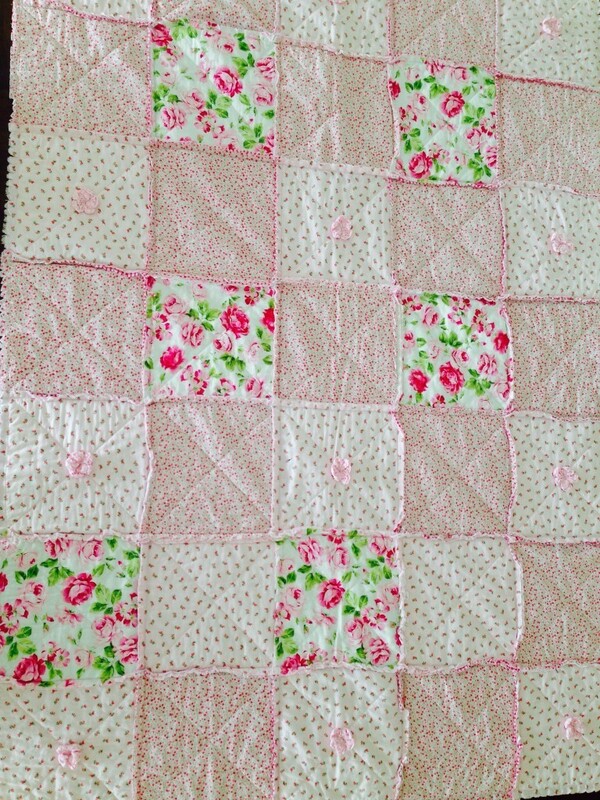 It’s quick, it’s easy, and the result is a pretty and utilitarian quilt. It’s there to be used and for warmth – and because it’s not heavily quilted, it’s so soft and therefore has terrific sensory and comfort appeal too! I bought some pretty rose fabrics and I wanted a quick project, just to have on the couch. It’s layer cake friendly. It’s turned out to be a hit! Everyone seems to want to get under it. It’s light and soft and heaven knows I’ve enjoyed catching a few Zzzz under it too from time to time. I teamed my rose fabrics with three pink Ginghams the for the underside pieces. 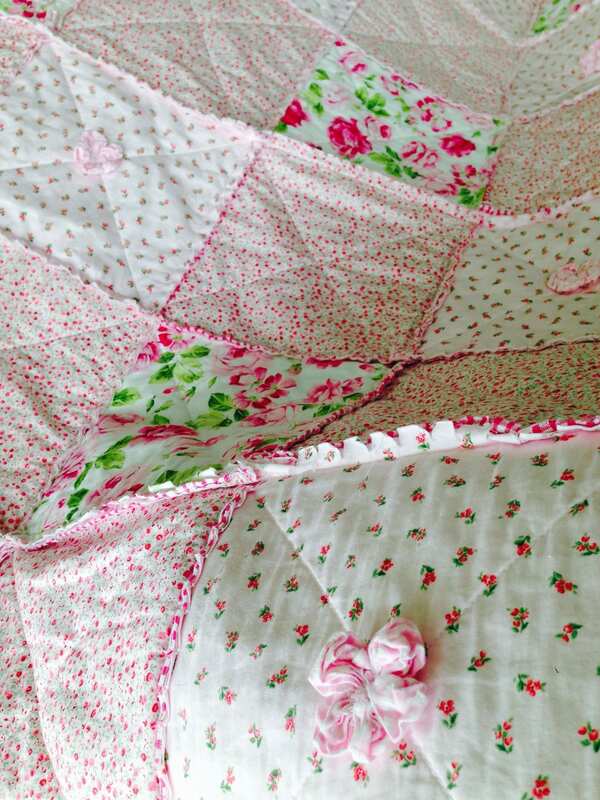 Gingham is an excellent choice for a rag quilt because it is double-sided. This means it will look just as nice on the front side of the quilt. The project comes together very quickly. I made it with 40, 10″ square block, quilt block sets and laid them out in a 5 x 8 configuration. Finished size approximately 48″ x 76″. 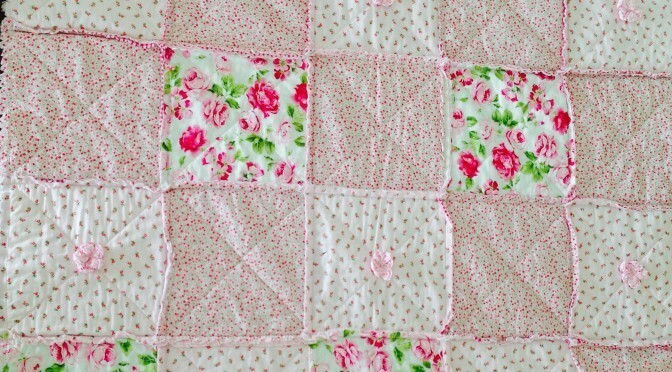 See my tutorial for further instructions of how to make a rag quilt. Once the quilt was sewn together and all the rag edges had been clipped, For something different, made 12 Suffolk Puffs and then hand stitched them into flower shapes and sewed them to the front side of the quilt, to embellish some of the squares. I thought the Suffolk Puff flowers enhanced the three-dimensional effect of the rag quilt. By the way, I used Bamboo wadding for this project. It’s very soft, light and drapes well. For a thicker quilt use cotton batting.